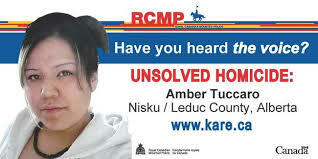 Amber Tuccaro was 20 years old when she went missing from Nisku in Alberta, Canada on August 18, 2010. At the time, Tuccaro was traveling with her 14 month-old son, and a female friend. They were on their way to visit the city of Edmonton. In order to save money, they planned on spending the night in a motel in Nisku. Tuccaro decided to go ahead into Edmonton that same night. She left her son with her friend and hitchhiked. She was never seen alive again. A conversation she had on her cellphone may have captured the voice of her killer. When Tuccaro did not return the next day, she was reported missing. Police discovered a recording of Amber's last phone call. While an unknown man drove her, Amber spoke to her brother, who was being held at the Edmonton Remand Center. All outgoing calls from inmates were recorded. On the call, Amber is heard repeatedly asking the driver where he is taking her. She even states, "You'd better not be taking me anywhere I don't want to go." In 2012, RCMP released to the public only one minute of the entire recorded phone call. At the time, Amber was still missing. Sadly, just four days after the audio was released, her remains were found on September 1, 2012 by horseback riders on a rural property near Leduc County. According to an RCMP spokesperson, the discovery of Amber's remains so soon after the release of the audio was, "entirely coincidental." The entire recording is 17 minutes long and Amber's mother, Vivian (Tootsie) Tuccaro, has heard it all. According to Vivian Tuccaro, the call ended abruptly with Amber sounding scared. It has been more than 5 years since Amber's death. The unknown male driver who gave her a ride has never been identified. There is a $5,000 CAD reward for information leading to an arrest in her case. Her family is working on increasing this reward. The results of an independent federal review found that the initial investigation into Amber Tuccaro's case by Leduc RCMP was "deficient." Early in the investigation, Tuccaro's case was removed from the missing person list, "leading to a month-long delay in the investigation." The review also noted that "the contact information of potential witnesses was not always recorded by RCMP." Amber Tuccaro's family publicly released portions of the review "in an effort to help other families of missing and murdered Indigeneous people."